This Handbook brings together and integrates comprehensively the core approaches to fear and anxiety. Its four sections: Animal models; neural systems; pharmacology; and clinical approaches, provide a range of perspectives that interact to produce new light on these important and sometimes dysfunctional emotions. Fear and anxiety are analyzed as patterns that have evolved on the basis of their adaptive functioning in response to threat. These patterns are stringently selected, providing a close fit with environmental situations and events; they are highly conservative across mammalian species, producing important similarities, along with some systematic differences, in their human expression in comparison to that of nonhuman mammals. These patterns are described, with attention to both adaptive and maladaptive components, and related to new understanding of neuroanatomic, neurotransmitter, and genetic mechanisms. Although chapters in the volume acknowledge important differences in views of fear and anxiety stemming from animal vs. human research, the emphasis of the volume is on a search for an integrated view that will facilitate the use of animal models of anxiety to predict drug response in people; on new technologies that will enable direct evaluation of biological mechanisms in anxiety disorders; and on strengthening the analysis of anxiety disorders as biological phenomena. 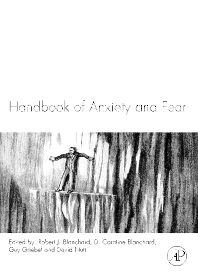 The Handbook of Anxiety and Fear is a lengthy and thorough review of the experimental, neurobiological, pharmacological, and clinical components of anxiety and fear. The text is written at a high level of detail, and the concepts within are supported by lengthy reference sections. This text ... does a wonderful job in covering the scientific basics of the topics.... there is strong coverage of basic science and the current state of knowledge in human clinical scenarios. This text is best suited to professionals and advanced graduate students who research anxiety disorders. Professionals wishing to review the scientific bases of the anxiety disorders would do well to include this book in their personal libraries.